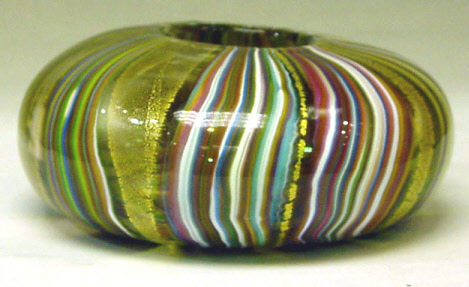 Zanfirico (2003 only) - clear base with rainbow stripe. 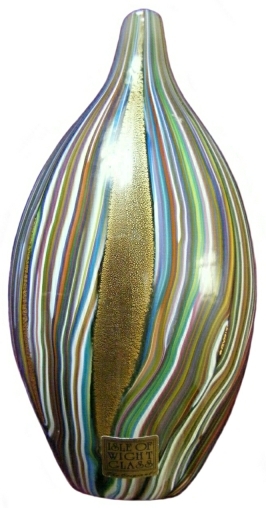 Zanfirico Oro - Black/White, Green, Blue, Pink, Multicoloured (clear or fumed), White (fumed). Zanfirico Pietra - Blue, Green or Pink - all available clear or fumed. Also known in Chololate-Brown. In Zanfirico Oro the colourways indicate the colour of the striping; the backgound colour is gold. In Zanfirico Pietra the colourways indicate the base colour of the glass. 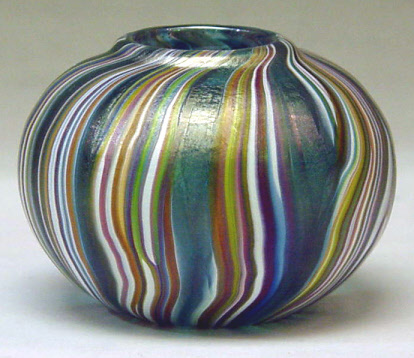 Cylinder vase, 22.5 cm high. 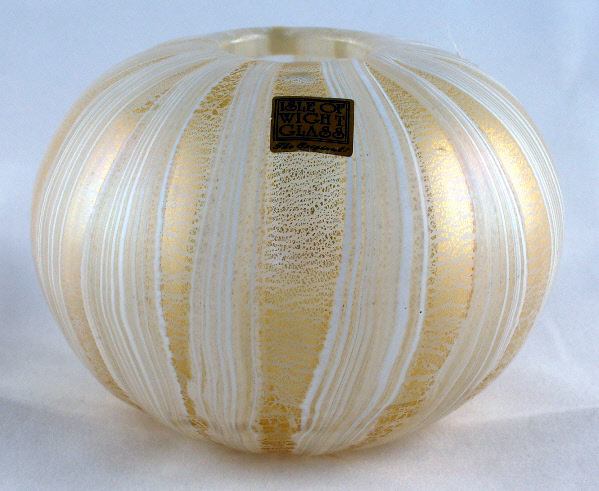 Gourd-shaped vase, 15.5 cm high. Gourd-shaped vase, 13 cm high, 6.6 cm maximum diameter. 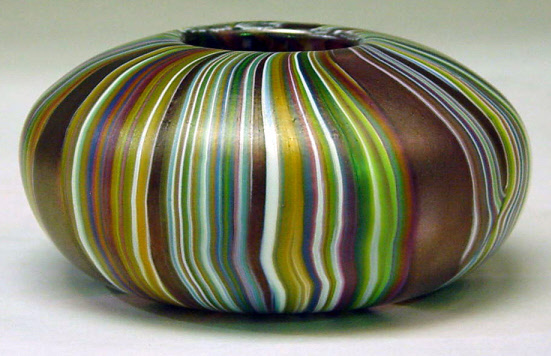 Donut vase, 7.5 cm high, 10 cm diameter. Signed “Timothy Harris Isle of Wight Glass England 2006”. 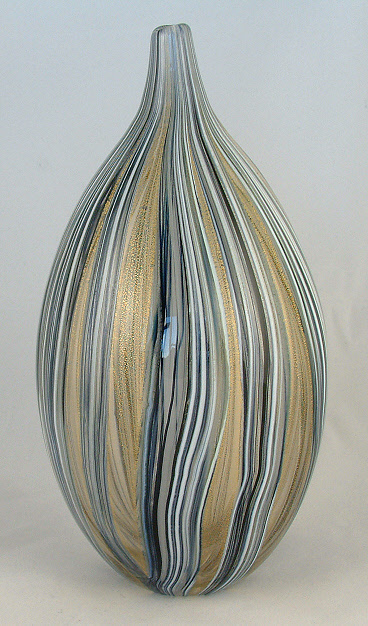 Cylinder vase, 21 cm high. 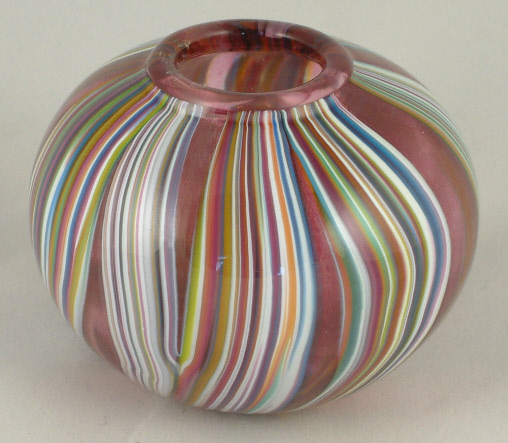 Small globe vase, 5 cm high and 6.5 cm diameter. This donut vase is in a non-standard colourway.